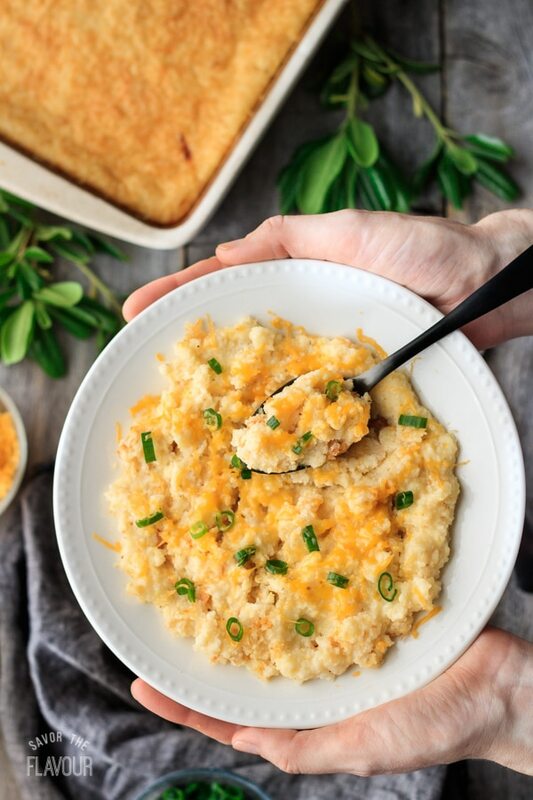 Southern cheese grits casserole is a creamy comfort food that can be served at breakfast, brunch, or dinner. This menu idea is so simple to make ahead for your family to enjoy at their next meal. 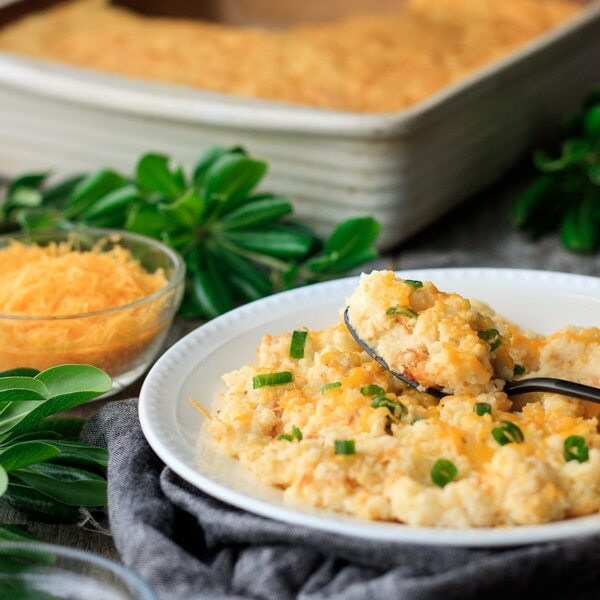 Since I grew up in Ontario, Canada, with parents whose ancestry is from the British Isles, cheese grits casserole wasn’t on the breakfast menu at my house. The first time I remember having grits was when I lived Savannah, Georgia and Busy Baker 🍞 was a baby. I was attending a large church event where both plain grits and cheese grits was served. To be polite, I took a bit of both, but to be honest, I only liked the cheese grits. Cheese can make an ordinary dish extraordinary, and if you combine three cheeses together – watch out for a flavor explosion. 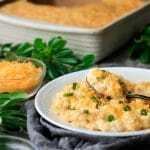 This cheese grits recipe is very versatile. You can serve it for breakfast with eggs on the side. It can make an awesome base for a veggie bowl at lunch, or if you’re looking for a savory side dish to serve at supper, skip the mashed potatoes and serve this instead. 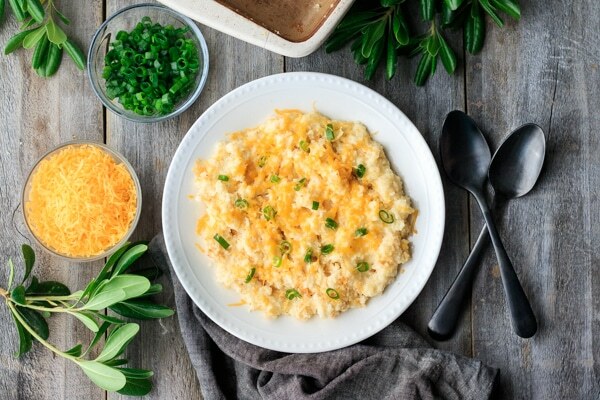 Garnish your Southern cheese grits casserole with a sprinkle of extra sharp cheddar and thinly sliced green onion. 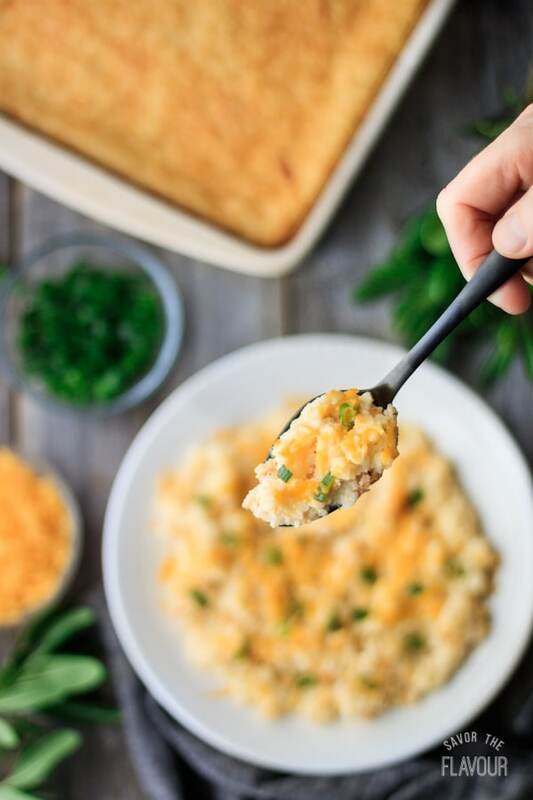 If you like this recipe, try out these other delicious Southern recipes! Sausage Gravy: a classic flavor-packed breakfast gravy you’ll love. Fluffy Buttermilk Biscuits: serve these delectable biscuits with sausage gravy or butter. Black-Eyed Peas: use up leftover ham with this yummy veggie side. Put a pot of water on the stove to boil with 1/2 teaspoon of salt. While you are waiting for the pot to boil, grate the three cheeses. Preheat the oven to 400 F. Grease the baking pan with butter. Once the water is boiling, gradually pour in the 2 cups of grits while stirring, then turn the heat down to a simmer. Stir until the grits have become thick, roughly 5 minutes. Remove the pot from the heat. Add 1/2 cup of butter, 1 cup of smoked Gouda, and 1 cup of extra sharp cheddar. Add the garlic powder, white pepper, and the remaining 1 1/2 teaspoons of salt. Mix well. Taste and adjust seasonings, if necessary. In a separate bowl, mix together the eggs and the milk, then pour the egg mixture into the pot of grits. Stir until well combined. Add a bit more milk, if necessary. Using a large spoon, transfer the grits into the greased baking pan and sprinkle 1/2 cup of Parmesan cheese all over the top of the grits. Bake uncovered for 30 to 40 minutes. The casserole should be set and a nice golden brown on top. Let stand 5 minutes before serving. Garnish with chopped green onion and shredded extra sharp cheddar cheese.